New focus group on “Developing your Core Strength”. January 22nd and 29th at 9pm ET. Spaces are limited and information will be sent out on Thursday, January 9th. Sometimes I have a hard time taking good care of myself. My good friend Barb has watched me burn out and melt down because I’ve allowed myself to get depleted. Why do I do this to myself? I know better. After all I’m the expert! And yet, I still struggle to actually practice good self care. I know I’m not alone. It isn’t that we don’t know how to take care of ourselves, or even that it is good to do so. Every day we’re bombarded with messages about how to manage stress, the value of good friendships and the importance of adequate sleep, exercise and healthy eating to our well-being. The problem isn’t knowledge. It is practice. Why don’t we do it? Because we’re too busy and we feel selfish, guilty and fearful when we take time or resources just for ourselves. Let me explain. Many of us try to be a Betty Crocker mom, a Victoria Secret wife, and a Martha Stewart housekeeper, all while working to help provide some family income. We tell ourselves we ought to home school our kids and feel selfish if we don’t want to or can’t. In addition we should pray and study our Bible every day, take care of our aging parents, volunteer at church, be involved in a small group, work out at the gym …and the list goes on and on. When we can’t keep up, (and we can’t) many of us feel guilty. We don’t stop to say “no” or set limits on what we can do because we’re afraid that someone might get mad or won’t like us if we disappoint him or her. But God never asks us to do it all. Rather he tells us to be a good steward of our resources. All of us only have four resources at our disposal. Our time, our talents, our energy, and our money. How we choose to allocate these resources not only impacts us, but also those we love. Therefore, it is essential that we give some thought to our deepest values and priorities. Feeling stressed out or burnt out exposes how we have been misspending our resources. For example, many people are overwhelmed these days because of high credit card debt and financial difficulties. Their resource of money has been overspent, and the consequences are now draining them emotionally and financially. We do the same thing with our other resources. We go into debt with our energy resources by extending ourselves over and over again beyond our limits, leaving ourselves physically drained and emotionally exhausted. Always hurrying is a refusal to accept the reality of time. We leave no margins for interruptions or delays and try to squeeze every moment out of our day. It’s not surprising that we feel like a taut rubber band ready to snap. Sometimes life becomes too hard because we have not been good stewards of our resources, including OURSELVES! We collapse under the stress of trying to do more than we have the resources to handle. Take some time this New Year to evaluate how you allocate your resources of time, energy, money, and talents. Ask yourself these two questions. Are you living within your limits, or are you always overdrawn? Do you budget your resources according to your values and priorities and your family’s needs, or do you use up your resources in order to live up to other’s expectations or gain their approval? Living unrealistically – always going into the red is not taking good care of yourself. It is STRESSFUL AND STUPID! It’s like giving someone unlimited access to your bank card. Don’t do it. Learn to say “no” when you need to and don’t feel guilty or fearful for doing so! Remember, there is a high price for being too nice! Question: Do you have a book on what steps need to take place after sexual infidelity in order for the marriage to truly heal? My husband says he’s sorry but I’ve heard that before. If I didn’t know about the affair, I’d think we had a fairly good marriage but now I don’t know what to think. I want to forgive him but I don’ t know how to forget what he’s done. It hurts so bad. Help if you can. Answer: I am so sorry. Sexual infidelity is betrayal of the deepest kind and tough to truly recover from. I think that’s why Jesus said it was one of the few grounds for biblically divorcing a spouse. For a marriage to truly heal from this devastating breach in trust, hard work must be done by both persons in the marriage. I haven’t written a book that specifically deals with adultery as a stand alone issue, but between How to Act Right When Your Spouse Acts Wrong, The Emotionally Destructive Relationship, and The Emotionally Destructive Marriage you will find the crucial stepping stones that will help you and your husband rebuild your marriage. However, couples often needs additional help when there is infidelity. Without outside accountability and support, most couples do not do the work needed to deeply heal the damage even if they choose to stay married. The first clue that something was wrong came when operators of the city's reservoirs noticed a 2 foot drop in water levels in the middle of the night. Crews were sent out to search for the leak and discovered a widening sinkhole which was swallowing up the water. Very early, before any business life entered the city , the menacing sinkhole began its destruction in the street. Corporate office plaza began to sink and crumble. Huge shards of glass and bricks tumbled to the pavement below as the building began to buckle and crack, teetering on the verge of collapse. 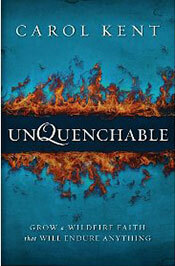 Unquenchable: Grow a Wildfire Faith that Will Endure Anything by Carol Kent. Plus see the winner of the previous give away! Where is your faith today-first sparks of faith, bright blue flames, radiating heat, raging bonfire, red-hot coals, cooling embers, cold grey ashes? Is your love for God burning so brightly that you are consumed by its passion? Are those who surround you drawn to its radiance and warmed by its heat? Are sparks flying from you, spreading a wildfire faith that ignites passion in others? Throughout history God has chosen fire to represent his awesome power, his judgment and wrath, his protection, and his Shekinah glory: the flaming sword guarding Eden, the burning bush, the pillar of fire, the fiery furnace, the chariot of fire, the burning coal, the flame upon the altar, the lake of fire, and the flaming eyes of the Son of Man upon the throne---these are only a few of the images he has seared into our minds that we might know him more fully. God is the source of that first flicker that sparked your faith and one day you will stand in his holy presence, look into the flaming eyes of Jesus, and see his burning love for you face to face. But between that first flicker and that heavenly meeting, there is life to be lived on this earth. The challenge we all face is that life can dim our fire or even quench it, whether by the soggy mist of the mundane, or the quenching downpour of crisis. Carol Kent has discovered that God's Word is filled with the secrets of nurturing his fire in our lives, sometimes painfully so, other times even undetected, refining, purifying, cauterizing, healing, and ultimately reshaping us into the image of his Son. Author and speaker Carol Kent will take you into God's word, and into your own story, to reveal the true power of the fire God has placed in you, to fan the flames of your faith, stir your passion, and embolden you to spark wildfires that will spread to forever change the landscape of this world beyond your wildest imagination. God's fire is in your life. Fan the flames. Burn brightly. Start a wildfire! To win this book, please email your name to assistant@leslievernick.com with "Book Give Away" in the subject line by midnight Sunday, January 18th. The winners of How to Live Right When Your Life Goes Wrong by Leslie Vernick are: Jessica E and Karen M.